Home > Back Pain & Work > Ergonomic Chairs: Do They Help Back Pain? One of the most common causes of lower back pain is sitting for long periods in a chair that is uncomfortable and that doesn’t allow you to maintain the correct posture. Hunching over a desk, perching on the end of a chair, or sitting with your back in a rounded position can put pressure on the ligaments in the lower back, causing aching, pain and stiffness. If you work at a desk most of the day, taking regular breaks to stretch and move around is a good idea but this can only make a significant change to your back pain if you combine it with a better sitting position. Ergonomic chairs can help, but finding the right chair for you can take time and it’s often expensive. An ergonomic chair is designed to provide support for the entire body, so that no undue pressure is put on the lower back. Chairs that do this are often called ‘posture seating’ or ‘orthopaedic chairs’. Because we are all different heights, shapes and weights and we all sit in different positions, there are many designs of chair available and finding one that solves your chronic back pain needs careful thought – and it’s essential that you at least sit in the chair before you buy it. This is one purchase that really can’t be done online so easily. Many models look like standard office chairs, but they tend to be more padded, look more robust and can have extra features such as padded neck rests and integral cushions that support the lower back. Others follow the increasingly popular kneeling chair design; these chairs have now back but have a seat pad and support for both knees. As you sit in a sort of kneeling position, you have no choice but to keep your back upright and adopt a healthier posture. Saddles stools also do this but tend to be higher, so that you sit almost in a standing position. This type of ergonomic chair can be very useful for people like architects, garden designers and artists, who need to be able to slide into their seat easily and may need a higher seat for working on plans, canvasses or technical materials. Adjustable ergonomic chairs that are either the standard office design, or saddle stools are also available with gas lifts for adjustable height – so that you can work at a standard height desk, or a laboratory bench, for example. Many people with chronic lower back pain benefit from spending parts of the day not sitting down, even if they have the best ergonomic chair that they can find. The same companies that produce posture seating also tend to offer adjustable, electric desks that can be adjusted to different heights without too much trouble. Raising the desk so that your laptop or work is at the correct height for working while you stand offers more flexibility and can help you alternate your position during the day. A vast array of ergonomic products other than chairs is also available for people with more serious mobility problems, or who have conditions such as repetitive strain injury or poor eyesight. Arm and wrist supports provide the best position for the hands when working on a computer and writing slopes, monitor arms and laptop arms that are completely adjustable allow you to position items on your desk so that you can use them comfortably. 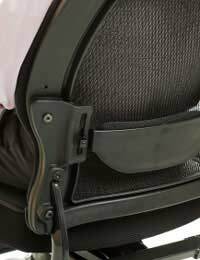 Pressure cushions, seat wedges and leg supports can all be bought separately for use with an ergonomic chair. Ergonomics – you can’t Start to Early! Many companies who specialise in ergonomic products to improve posture provide furniture for children, such as ergonomic sloping topped desks and supportive chairs. With most kids spending many hours at a desk, either doing homework or using a laptop or computer, getting a supportive good quality chair that can be adjusted as they grow can be a sound investment.